In today's corporate environment, a business could have all the tools and funding in the world. Without an efficient and impactful workforce supporting its efforts, though, the company has little hope for success. Recently, administrators have been more often turning their focus inward on their enterprises, especially when it comes to their employees. Keeping these workers happy translates to increased collaboration, and as a result, a boost in overall production. However, when it comes to these processes, ensuring staff members' satisfaction with their jobs is often easier said than done. There are several strategies successful companies leverage to gauge and improve the way workers feel about their careers, and other organizations can follow suit to do the same. One of the first steps companies can take in these regards is to be open for honest feedback from staff members. After all, how can improvements take place if there is no benchmark against which these efforts can be measured? Some businesses allow employees to take anonymous surveys, where they can be forthright about their feelings pertaining to their individual position, management strategies and the company as a whole. Even a simple message from human resources personnel reminding workers that their door is always open can be beneficial in these respects. One of the best ways to ensure satisfaction with one's job is to arm employees with all the tools they will potentially need for every facet of their position. There's nothing worse that being under-prepared, and companies should actively work to avoid this. This thinking should also extend to the initial training staff members receive when they first join the organization. "Simply throwing newcomers into a job and letting them fend for themselves results in their being socialized by default rather than design," noted Jamie Gruman, a University of Guelph professor. 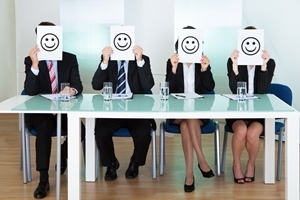 "Companies benefit from boosting their employees' well-being. Helping new hires adjust at the start empowers them to achieve their potential later on." Technology can also be leveraged to improve employee satisfaction. Letting workers listen to music while they work, visit social media during downtime or change computer settings can enhance overall morale and lead to increases in productivity. However, especially when it comes to adjusted machine settings, enterprises need a solution that will provide a safety net to prevent adverse effects of too many modifications. "But that flexibility can quickly lead to disaster if [employees] wind up ruining their computers, bogging them down with garbage apps, or worse," PCWorld contributor David Murphy wrote. One of the most effective ways to address this issue is with a reboot to restore solution like Faronics' Deep Freeze. This system gives administrators complete control over all workstations in the corporate network, and even provides remote capabilities for geographically dispersed locations. With Deep Freeze in place, supervisors are able to reboot machines to restore original settings, removing any harmful or unnecessary items workers may have downloaded. This way, decision-makers can allow the flexibility staff members need while still maintaining oversight of their technology assets.